Right now, the only way to play Assassin's Creed on the Nintendo Switch is via cloud technology, currently limited to Japan. It leaves anyone else wanting to take Ubisoft's popular franchise with them on the go, with no way to play at all. Fortunately, there's still some hope left, with multiple rumours over the past few months suggesting the Switch would eventually receive an Assassin’s Creed compilation of sorts. The original rumour stems from a listing by German retailer MediaMarkt and since then there have been a few other listings signalling Ubisoft’s long-running series is making the Switch. According to these online retailers, the game is due out on 15th February and is priced at $35/€35. 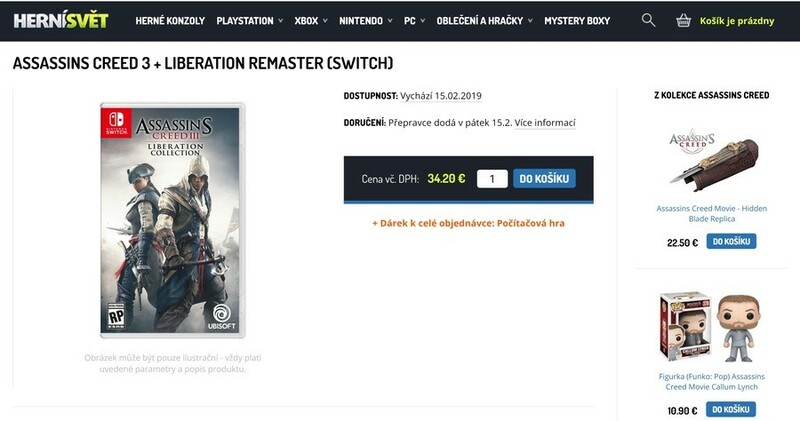 If this is genuine, the release date is likely to be a placeholder, as Ubisoft hasn't made an official announcement confirming the game's existence on Switch yet. In saying this, the remaster has already been unveiled for the Assassin's Creed: Odyssey season pass available on Xbox One and PlayStation 4. To view the content in the remaster, visit the Ubisoft support page. What do you make of this listing? Would you be interested in playing Assassin's Creed on the Nintendo Switch? Tell us below. Pretty cool, never played 3. Liberation was solid on Vita, wouldn't mind playing that again on a bigger and better handheld. How well would this sell? How desperate are people for a seven-year-old Assassins Creed that isn’t even the most fondly remembered in the series? I’m not sure. Still, I’m glad to see Ubi’s continuing support for Switch. Not overly excited about these to be honest. I mean, sure its great that they are coming to Switch but personally Black Flag would have been a much better choice. Lost interest in both of these games prrrretty quickly. AC3 was a great title and im looking forward to playing it again on Switch if this is true. Would be nice. I haven't played any of AC games so this could be a good start as I also like games based in centuries ago. 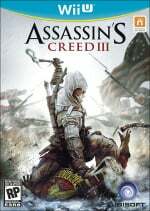 I've never played AC 3, is it any good? Liberation is okay-ish, played on PS Vita but wouldn't buy it again. My kids loved the series, I didn’t get to play them so for me it would be worth a go at least. 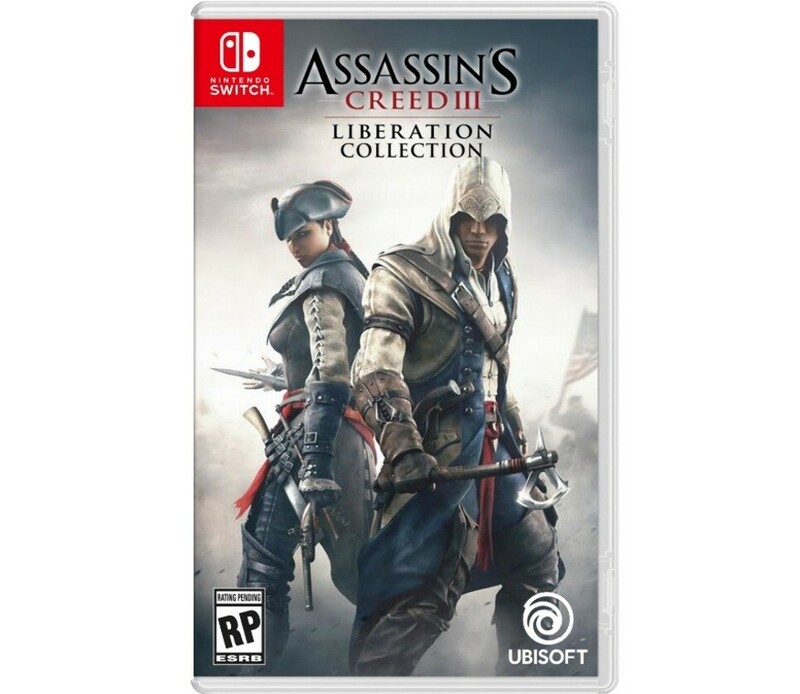 AC3 was a low point in the series for me, but still good to see games like this on the Switch, hopefully we'll get Ezio collection. The Switch can easily have all AC games up to Black Flag, as doubt it is powerful enough to run AC Unity, onwards without being cloud editions like Japan got for Odyssey. More good games the better. Nobody wants this do they? Why not origins or odyssey? These are two great games. Setting is fantastic. Day one for me. Don't know if I would buy it again, but I loved AC3 on the Wii U, got every single thing in the game except the pivot points at the end. I bought Black Flag but never got around to starting it, so if they remastered that I would definitely go for that or if they bought over Unity or Syndicate. My friend at work hates AC3, but I enjoyed it for the setting (American revolution is a time that really interest me).. This is more than Vita got, and both these games will look better. So I’m not complaining (though AC4 Black Flag would be really nice). At the end of the day, it’s 2 AC games on Switch, fully portable. I figure if this does well they’ll bring more. Just don’t expect the recent entries. They won’t get those running. Of course they choose the only one I’ve played and ungortunately didn’t like. So will definately pass this one. Like others say Ezio collection would’ve been better. I absolutely hated Assassins Creed 3, even though the story starts out good it soon goes down hill for me. I’d like to see the Ezio Trilogy, Black Flag and Rogue if possible. Can’t see Unity coming to the Switch as it struggled to run on a base PS4 until Ubisoft managed to patch out all of the glitches. Never really liked AC3. Would rather see Black Flag if they’re going to port older titles. I got this when there wasn’t much to play on the Wii U. Thank jiminy it looks like we can be selective on the Switch. AC3 gets a lot of hate but its my favourite game in the franchise and i love it to bits! I'll already be getting it day 1 on PS4 (as part of AC: Odyssey's season pass). But since the price is so low, i may also pick it up on Switch! I'm very happy with this news! Liberation was actually my first taste of the franchise's gameplay - I got it on a sale among my first Vita games (due to how PSN treats card and regions, I had to grab a big payment card for FFX/X-2 and was curious where to possibly invest the change), but I only had 8 Gb of memory at first, needed space to check P4G also bought on the same sale and had no intention to start the binge that far into the franchise. Still, I liked what I tried then, and I might ponder a chance of double-dipping even if the game wasn't listed as bundled with 3 here. Problem with releasing this game is that there is a very limited audience that will pick this up amid the other fine games coming in the first quarter. On a side note I think I’m starting to feel the Metroid blues. I was hedging a lot on that being the adventure game that blew me away on the Switch (a la Breath of the Wild) in 2019. There is still Pokémon I suppose, but I’m not as big of fan of that series. Feeling like some old Assassin’s Creed game you can play on the WiiU won’t satisfy in the least. Just throwing it out there this is quite likely as it's already been confirmed to be coming to xbox and ps4 as part of the odyssey season pass. @NotTelevision Maybe there will be another adventure title this year that hasn’t been announced yet. Or if you haven’t played Dragon Quest 11 yet, that might scratch your itch. I want AC: Unity. Let's see how they make 10,000 active NPCs work with Switch. Not even Panic Button will dare to port this game... especially running on that Unity engine. Unlike most, I actually really enjoyed AC3! Loved exploring the wilderness and it was a great, meaty game with a lot of gameplay variety. Sure, it's not one of the absolute best in the series, but great nontheless. Not sure I'll ever replay ANY AC game though. While I do enjoy them, they are really time-consuming endeavors, and I just have too much else to play as it stands already. 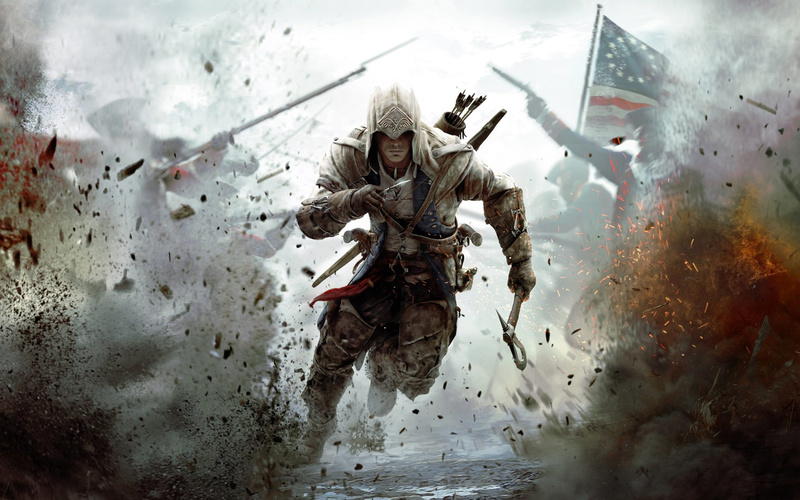 A AC3 has been confirmed for the other consoles, but those were slated for March. It's possible there's a Switch version but I don't see Ubi pushing the date forward. The cover art does not make this more convincing. I could knock that together in five minutes. Anyway, Black Flag is a far superior entry. Never really understood the appeal of this series. Granted, the narrative seems neat and the concepts presented are unique but the more I hear about it, the more convoluted it all becomes. Kinda tired of the almost endless slew of sequels and lacking of new gameplay mechanics and evolution of the formula as a whole. I might be in the minority here but this seems like a waste of time money and resources. Kudos on anyone enjoying it though, it’s just not my cup of tea, you know? Assassin's Creed III on Wii U was the only Creed game I played through 100%. It had a great theme, my favourite two main characters, and an interesting wildlife/survival part to it and a neat townbuilding part, and also the first touch of battle ships, and a fun online multiplayer. The other games in the series unfortunately didn't hook me, but Creed 3 was pretty damn good. Would be a plus for the library even if not something that interests me particularly. Black Flag and Rogue I may have take a punt on, maybe if this does well the other last-gen games will follow. Well it was on Wii U, so a Switch release was inevitable. Not a fan of Assassins Creed, I played the original & found it pretty poor. I kept being told it got better from AC2 onwards... but the comments I'm reading here lead me to believe that AC3 and onwards are bad? Does that make AC2 the only good Assassins Creed game? So perhaps in comparison to the timeless classic that is AC2, it's a step down. But on it's own merits it's a fine game. Fine game indeed. First to introduce water battles that Black Flag expanded upon. Had a very intriguing setting (at least to me). This makes little sense to me. They should do something like a collection and not this. Should include all games except maybe the ones from the last years/more demanding ones. Origins and such. NintendoLife's post based on mine one? What an Honor. Not a great AC in my view, Now a Ezio collection! that would be the business. I would love to replay those on my commute every day. Because they're already remastering the games for PS4/X1 as part of the AC Odyssey season pass and as a standalone release. And if they didnt bring them to Switch, everyone here would be saying "Why couldn't they release those games on Switch? They could run"
Way too low price. Two games in one package fir that price? Haven’t they learned from Nintendo? Compared to other games in series this one is especially slow and clumsy by todays standards. Weird choice to put this on Switch. Also the 35 euro price tag is travesty. Not a weird choice at all considering it's getting released on other systems. ACIII was a buggy mess when I played on PC near launch. Would love to try again on a console that won't have compatibility issues due to hardware differences the developer couldn't reasonably foresee. Pretty good, actually - I stopped playing after II and its expansions, so this is exactly where I need to pick back up. Played this already. Not buying again. Ubisoft gave us a great game in Mario rabbids on the Switch, more like that would be much better to me than old ports like this. Considering AC3 Remaster is confirmed for other consoles, it makes sense. It's not as bad as people remember it, but it was always kind of a weird one as it left behind the vertical cities on the previous games, which was kind of the whole point of AC games up to that point. Are the people complaining about a port of a game from 2012 the same people that recently bought NSMBU Deluxe... ? I never played the DLC for AC3, if it includes it, might pick it up again. From all AC games, never got to play Rogue. It would be awesome if they did that next. It's easy to take a box art. Are we sure this isn't just some random retail store trying to drum up website hits? I'd prefer Black Flag, the scope was better. One of the few Wii U games I want to complete some day. @LuciferOnReddit Problem with that is that these games take up A LOT of space. The Ezio Collection containing the three AC2 games takes up around 40-45GB on the other consoles, and they'll probably have a hard time fitting an AC3 remaster AND Liberation on even a 16GB cart. As much as I'd like to see a collection, it's not really viable with today's space constraints. As a long-time fan of the AC series (Since the first installment when I played on the 360), I’m ecstatic at the prospect of ACIII and Liberation coming to the Switch as they’re some of my favorite in the series - both lore and gameplay-wise. They really perfected the counter-attack maneuver in these two installments which made the unrelenting fights against guards and enemies a breeze compared to Altaïr’s and Ezio’s games and fast traveling required less time committing to the world economy and focused more on just exploring the world. What worries me about this particular prospect, however, is that box art. While I thoroughly enjoy it, I’ve been using that picture as my iPhone wallpaper for years and I worry that someone just made up the box art to get a rise out of Switch owners and fans. I'd give 100 indie games for 1 new AAA title on the Switch. For these old ports, I'd give 50. The Switch desperately needs AAA games. NHL (NHL94 was the last one on a handheld PSP, we are due for one). Batman Arkham (any of those). How awesome would open world Batman be on the go. Wait but is this OG ACIII or the remastered version which is also coming this year to PS4, Xbox One and PC? I heard that the remaster was also getting a standalone physical release for those who didn't get Odyssey's Season Pass. @BlueBlur101 So basically Switch owners are getting the equal treatment for once, as they are getting this the same time that Xbox and PS4 owners get their standalone version. Why bother? It's the worst one of the whole series. ACIII is the first one I ever played, and what got me into he series. I think this is great. Don't know why it gets the hate it does. I feel it is at least the same amount of fun, if not more, than the games that came before it. @IHateTombs because of money, they can charge individually for each game instead of one full bundle, more profit for them. lucky for me i got this included with the season pass with odyssey, don't do 3rd party on switch anyway. My initial reaction was "why Assassin's III of all games" but thinking about it for a bit and reading some of the comments definitely makes the situation make more sense. A lot of Nintendo fans have nostalgia over this game as it was a Wii U launch title and the game is apparently already being remastered for other systems. That being said, I probably won't pick it up. While not a bad game, it was probably my least favorite in the series. If I have the urge to replay it, I'll probably just dust off my Wii U. Who knows though, if it gets really cheap eventually and performs better I could change my mind. @Bolt90 i've played all of them in the series but 3 and 4 is the most one that stands out for me imo. If you are given an option to change the controls to modern Assassin's Creed controls I'll pick it up again. If you go back and play any of the older games. They just feel like tests of patience to me. I’d love to play through 3 again. I enjoyed it in the Wii U. And I need Black Flag please. Why does it desperately need them? I would have rather have the Ezio collection, Black Flag or Assassin's Creed Rogue. Not my first choice as Connor was the biggest cry baby! It would be fun to finally have an AC game for the switch. Seems pretty cool, although I think I would've prefered a remaster of the older games or Black Flag instead. I’d rather have Rogue, which was criminally fun, but I’d probably grab something like this, too. You’d think Ubisoft themselves would announce if it were legit, though. I loved the series for 1 and the Ezio trilogy. Three was a huge let down, Rogue was alright. Unity was good but the glitches and the irksome online missions ruined the experience for me. Syndicate was ok. Origins was where I decided I was over the series. I had to force myself to finish it and felt it was a waste of my time. I still haven't finished Black Flag because the boats are the worst thing in the entire series. @NicolausCamp FWIW, 32GB Switch gamecards are available for developers now, with 64GB cards due to become available at some point this year. I really enjoyed Assassins Creed IV Black Flag on the Wii U and if Ubisoft ever ports either the Ezio Collection or the Black Flag I'll happy to get either of those ports for my Switch. Never finished it on Wii U, but I'd be more inclined to play it through on Switch. I think I got about half way through, then had to travel for work and just never went back to it. I did play through Liberation on Vita and enjoyed it. If that price is accurate, I'll give 'em both another run. If they can bring ACIII then that means AAA games can happen on Switch and the Nintendoomed will still find a rally cry again. Can't say I'm too excited for this. The story took such a huge nosedive in AC3 that it killed the series for me, and I haven't bothered since. Granted, it came after the Ezio trilogy, which was amazing. But even on its own, it doesn't live up to its potential. @BlueBlur101 thanks for answering my question unwittingly, people are acting like this is just going to be a last gen port when they've already announced this remaster for other systems. I unfortunately already picked this up on a steam sale pre order, but I feel like Ubisoft is one of the better 3rd party supporters of the switch. I love this game btw, the time is super devestating and interesting. AC: Origins was what brought me back to AC. No real desire to play the old ones again. I've tried to play Assassins Creed games but they've all just bored me. I bought AC3 on the Wii U for $15 because the ships looked neat, but ended up giving it away because it was just as bad as the first two. Since then I've tried Black Flag and Syndicate ; quit both as they were still boring. Now Odyssey looks interesting but I fear that it'll just be like the others when playing. So I wouldn't buy AC3 on the Switch as I have them all on Xbox Gold already (for 'free') and I can't be bothered to play them on there, let alone pay full price for an old (boring) game. I'll probably also double dip on Switch since Liberation seems to fit that system naturally. I was just trying to assure myself that it was indeed the remaster. I'm not sure how I feel about this to be honest. AC III isn't a bad game, just not a very memorable series entry IMO. I'd kinda like to try Liberation as I never had a Vita, but apparently that one's also missable. I'd personally welcome another opportunity to play Black Flag on a Nintendo plarform (loved it on Wii U) and would be okay with receiving the Ezio Collection as well. Wake me up when they say Odyssey is coming over. Real physical release, download key on a cart, or that streaming BS? I'm only interested if it's the first one. @Peach64 To be fair, NSMBU came out exclusively on a console barely anybody bought so most will have missed it first time around whereas AC3 came out on every main home platform even including the Wii U. So it's not really an equal comparison. Plus also, AC3 is a game that's been discounted time and time again and even given away free on Xbox Games With Gold, so there's much, much more of a likelihood that many more people have already played it. Assassins Creed 3 was where I lost my love for the series. Played Black Flag but I was done by then. For anyone thinking this is fake just to drive up hits: who would think AC3 would drive hits??? If you going to go take, go Etzio Collection or Black Flag, those would get a lot more attention. ill take black flag over 3 any day. Well, no new AC coming this year so....TIME FOR PORTS! Awww, was hoping it would be AC2. Well, it's something I guess. How many dozens of people asked for this? Has that artwork been seen before? If not, it's probably legit. No-one would care enough to fake that. Not too interested in yet another old game. I’d like some new games that aren’t indies for my switch.. I suspect Assassin's Creed Ezio Collection will be ported to the Switch as well. Same for FarCry 3 and/or 4. Good to see that Ubisoft is not longer scared of porting M-rated games to Nintendo hardware anymore. I think Ezio will be one of the fighters in the smash bros dlc, lots of cross over between Nintendo and Ubisoft these days, so why not. Well that makes sense I suppose. Personally I won't be replaying III after nearly 100%ing it on Wii U though. I hope it will be a decent upgrade audiovisually for those who do want to play it. Looks like I'm in the minority on this website but I love AC3! It was my entry into the series and for that I'll always fondly remember it. I much prefer this style of AC game over the generic action-adventure open world RPGs they put out now. However, I've been craving a remaster for this game for a while now and for that reason, I'll likely get the PC version (if there is one) as I'm willing to sacrifice portability for graphics on this one. I'm glad that Ubisoft is still supporting the Switch though so I hope it sells well. Ezio Collection, Black Flag, and Rogue would also be nice. I never understood why they didn't release Rogue Remastered last year. I figure the Switch version will have some small improvements like Dark Souls and LA Noire, but will be fairly close to the Wii U version (but with a better frame rate and 1080p resolution). The big thing here is getting a mainline Assassin’s Creed game portably in HD. Hopefully Ezio Collection will follow. But, for now, I’m just happy seeing this. The debut of the franchise on Switch means we now have 2 AC games on the good ole hybrid. Fake! Made by some art student. A art director don't was allow a art with heads at this level. Are some other problems in the art. But the heads is the worst. I hope this isn't part of the next Direct. Waste of space. Welp. If this is true it makes that season pass for AC Sparta that I bought a waste of money. Oh well. Bring it on. I’m game to double dip. Can we get rogue hd as well? Actually if they just want to port all the last gen AC that would be great. Finally! Assassin's Creed on Switch. I have little reason to believe this is fake. Should we expect an official announcement in the the next couple of days? Or better still, a new Direct to announce it in? I didn't get too far into 3 but I liked it (even though it was very different from the Ezio trilogy). Never played Liberation, despite owning it three times over. I wanted to finish 3 first, which I never did. @DanteSolablood The first AC game was an oddity for sure. It took me ages to really get into and it was much different than I expected. Somehow, AC2 clicked with me straight away. AC2 is the game I expected the first one to be like. The original cover art was pretty violent. A dude was getting axed in the face, so they probably had to change it. But why this game? This is one of the weakest AC games. The only AC I personally want on Switch is Black Flag. I have no idea how many countless hours I spent sailing the high seas in that game...not fast traveling...just sailing...listening to sea chanties...fighting through storms...plundering enemy frigates... My favorite AC game BY FAR. Three for me was kind of...meh...and I had to struggle my way through it to the end. Although I would still buy this package if it came out, if only to play through Liberation (I had just gotten that for my Vita shortly before it got obliterated by water). So at least that part of the game would be new...oh...and the mad General Washington stuff; I never got the DLC on Wii U. @KryptoniteKrunch With way better graphics as-well! How will you not look Spanish? I know, we'll call you Connor! Now, hold the stock forward and press a. 3 = worst game by far for me in the series... :/ Would love any of the others coming over! Black Flag however takes the best parts of AC3 (the naval battles), and adds a pirate theme, which was awesome. I would gladly re-purchase ACBF... AC3 not so much. Assasins Creed 3 was the end of the franchise for me, i finished the game but it was more of a chore , i have black flag and rogue but because of 3 i never felt the need to finish them. I'd play Black Flag on the Switch. I started it on Wii U but never finished it. AC 3 was just meh, not a huge fan of it. They have odyssey on japanese cloud play. so this might actually be a real thing but i want some SYNDICATE THAT game was awesome. This seems a bit pointless, I think you need to bring a bigger collection if you are going to bring such older titles from the series. I'd love to play Black Flag again. The story wasn't great, but dang raiding ships never got old.